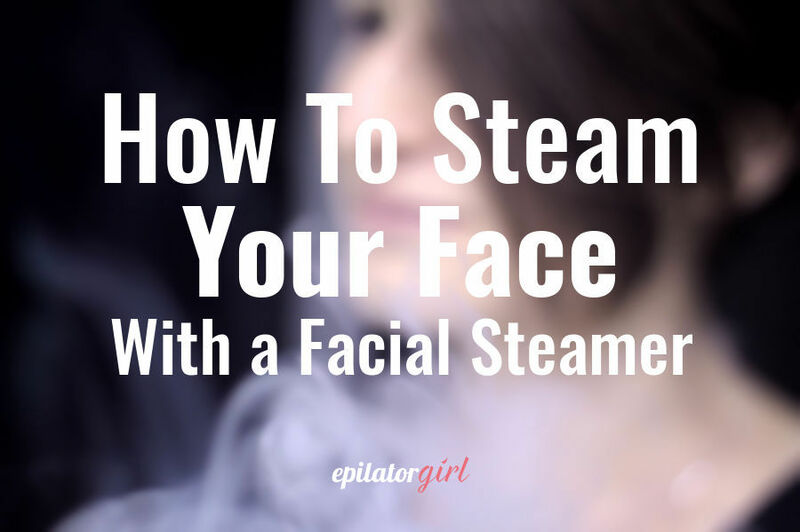 EpilatorGirl > Tips > How to Steam Your Face: Is a Facial Steamer the Best Answer? If you’re searching for a few methods on how to steam your face, you’ve come to the right place. And I don’t say that just because I’m writing this post. But because I have tried these DIY methods that I’m going to talk about. Once you’re done reading, you’ll know how to steam your face in the most convenient way for you and your needs. Is it good to steam your face? Is steaming good for dry skin? What do you do after you steam your face? Let’s start with the best and most convenient method. Using a facial steamer to steam your face and open your pores is the easiest way. It doesn’t take a lot of effort from your part. A facial steamer if the perfect way for creating an amazing at-home spa experience. There are plenty of affordable even cheap units to pick from so that’s easy to. You just need a few steps and you’re ready to steam your face in the comfort of your home. It all starts simple enough and it goes on the same way. All you need to do is to place your unit on a flat surface near a power outlet and grab a chair. You should cleanse your face before placing it in the path of the mist. You can also exfoliate, either before or after the steaming, or both if your skin is not the really sensitive type, like mine is. Each unit comes with a water tank. The size of the water tank indicates how many minutes of steam you will get. On average, 10 minutes of steam should be plenty. A 70 ml tank can give you that. You should use just purified/distilled water. There’s nothing left to do than to plug it in into a power outlet and turn it on. A continuous mist will come out in 30 seconds or a minute. You should place your face at least 7-8 inches (20cm) from the unit in order to avoid any harm to your skin. For the exact distance and much more info, read the user manual that comes with your unit. Let the mist open your pores. You will start feeling the results in no time. From time to time, use a clean dry towel to blot your face. If you want to trap the mist more efficiently, put a dry towel over your head. When there is no more water left, the steamer shuts down automatically. If you have a unit with a big water tank (like 200 ml that offers 30 min of mist) you can use the rest of the time left to humidify your room. Let the unit cool down for 10 minutes. Wipe if before storing. Now comes the part where you take advantage of those open pores. And that’s it, I told you it was an easy method on how to steam your face. When thinking about this method, there’s actually a scene that comes to mind. A guy sitting in a chair with a towel wrapped around his face before getting shaved. It’s usually used for that because it softens the hairs. It’s true that this method opens up the pores but not as effectively as a mist that runs into your skin for 10 minutes. It’s just not as effective. 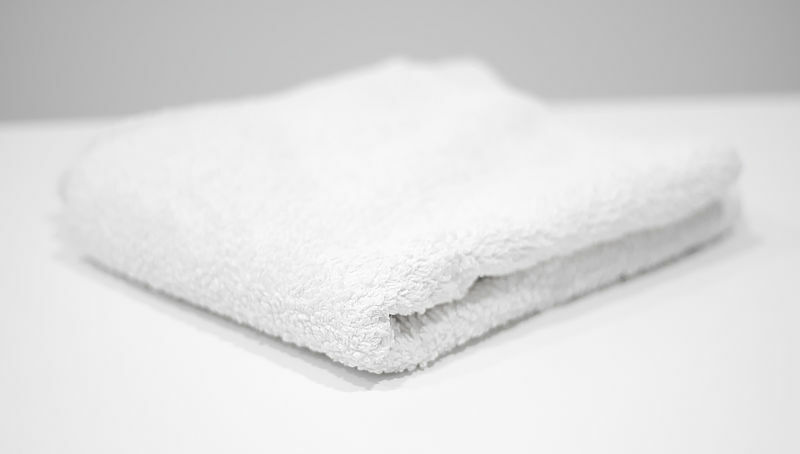 You need really clean towels without any bacteria every single time. It’s too complicated for me. How do you make a hot face towel? There’s one more method that I have to talk about when it comes to how to steam your face. No fancy facial steamer is needed but, for me, it’s more than welcome. It’s the method used by our mothers and grandmothers. 2. While the water boils, prepare your face – exfoliate/cleanse. 3. Pour the boiling water into a bowl. 4. You can add essential oils, too. 5. 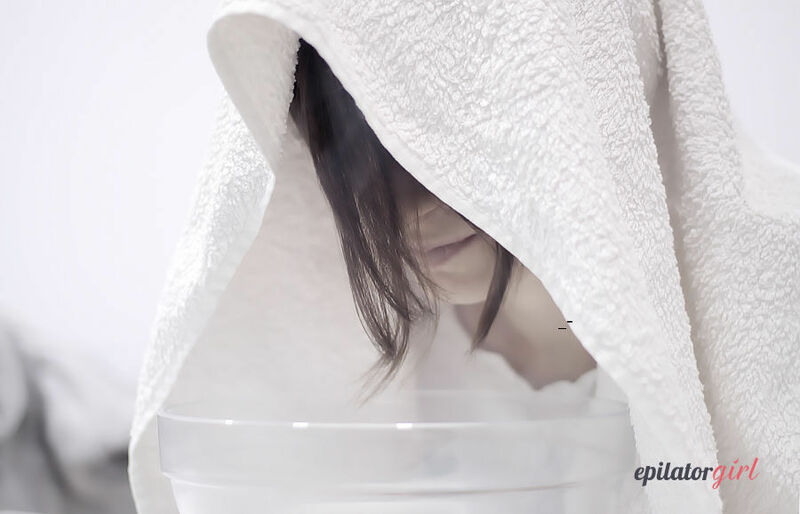 Place a towel over your head to trap the steam and stand over the bowl. Don’t stand too closely so you don’t harm your skin. 6. What comes next is the step 8 from how to steam your face using a facial steamer, you’ll find it above. It’s the part where you take care of your face, where you complete your at-home spa experience. Given that I support that including by writing this post on how to steam your face, I’d say that it’s very good to steam your face. Those suffering from skin conditions should consult a dermatologist and ask for a professional opinion. Start with once a week. If it’s too much then once every two weeks. My opinion is that once a week is more than enough. Many facial steamers don’t advise using essential oils. Only purified/distilled water is allowed to maintain the unit running for a very long time. If you use the old-fashioned head over a bowl of boiling water, you can add essential oils to the water before steaming. There are many essential oils with many properties, you just need to find the right one for your problem. Dry skin won’t start to peel if you steam your face because you will take care of it after the steaming is done. You just need to moisturize. I use a vitamin C serum and argan oil combined with vitamin A and vitamin E.
When talking about how to steam your face, one of the most important aspects is what to do after. Steaming opens up pores and you need to take advantage of that. I definitely recommend using a clay mask, like the Aztec Indian clay. It cleanses the skin and eliminates toxins at a whole new level. Then you should cleanse or gently exfoliate, depending which one works best on your skin type. Splash cold water onto your face and get down to moisturizing. At this point, you can also apply acne treatments. All these products will be absorbed by the skin more deeply. Would you choose a facial steamer to do the work for you in the best way possible or are you going to stick with the more traditional method on how to steam your face?